We are working with four trainers in competing and marketing our horses. Two trainers are in the Northeast (Tricia Moss in Boston and Jassa Williams in New Hampshire), Kiersti Wylie in southern California and Taylor McMurty in Chicago. 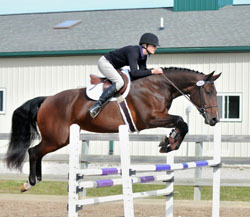 Tricia and Jassa have a diverse collection of eight horses for sale or lease—hunter, equitation, eventing and jumpers. The horses range from 7 to 16 years old. 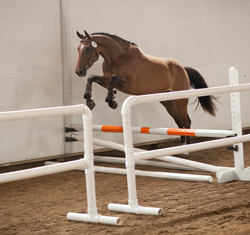 All horses have show experience and range from 2-6, green or experienced hunters to 1.2-1.3 level jumpers that are still progressing up the levels. We will be shipping in some new horses in a few weeks that will include a couple more experienced lease horses and some new prospects. Kiersti Wylie is helping us develop a presence in the southern California market. She competes in eventing, equitation and jumping. She has three of our horses: Chinaloma, Balera and Elinde. 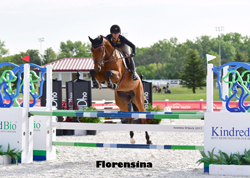 •	Chiniloma is a consistent winner in the show jumper ring in the 1.1-1.2 classes at major shows. •	Balera is competing well in equitation and jumper classes at major shows. Taylor McMurty is working with our high potential jumper horses. She just sold Florensina a beautiful, smart horse with great jumping technique. We will be moving additional horses to her this year. Please check our horse sales page. We have an extensive list of top KWPN horses available. Some we bought as foals in the Netherlands at the top jumper foal sale (Starsale) with the guidance of VDL Stud. These are among the top filly jumper foals that were marketed. When they were judged by KWPN judges at Keurings, when the fillies were 3-4 years old the Dutch judges rated as top tier horses in North America, frequently rating them as Keur. They are consistent with the top quality of horses that Claybrook Farms produces. We breed very talented horses with good minds and temperaments. Aviator is being leased in Boston. His show record is quite impressive and he continues to do well in competition. Elite is being showed and competed by Cory Hardy and his wife. Endeavor is showing with Carl Catani from River Wind Farm. Diesonnevanck "Die" is with Jennifer Blades at Willowbrooke. She is getting great show experience and is doing well in the hunter ring. Chiniloma "Chin" started out as a jumper horse but as she progresses, it is looking like she will be a lovely equitation horse. She is with Jassa Williams in New Hampshire showing in the baby greens, three foot hunter classes, and jumper classes. Balera is with Jassa Williams in New Hampshire and is on her way to becoming an amateur eq horse. Currently she is getting more experience in the hunter ring doing performance hunter classes, and winning the hacks. Vakina is out in Boston and she is being leased. She proves to still be a very gentle and calm minded amateur horse. She does classes in the hunter and jumper ring. Encore- Summer of 2015 he competed in the $100 Pre-Green hunters and placed in the top 3 over 40% of the classes. He won the $100 Pre-Green Hunter 3’ Championship at the USHJAM Welcome this year and was nominated and competed in the $1000 Pre Green Incentive Stake, placing 3rd. 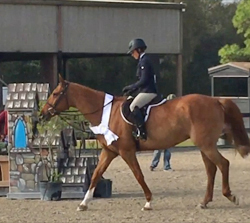 Erusa- 2009 mare that was just recently sold to do eventing out in California. After the barn fire in December, we were very fortunate to have resources that were willing to help us in terms of relocating some of our horses. First of all, Mares and Klaas Vanderploeg have helped us by allowing us to keep nine horses at their place as well as use the indoor arena for training. They are just about five miles away, and that has been very helpful in continuing to get horses ready to go other trainers for lease or sale. Secondly, there were multiple trainers who graciously took in some of our horses and began working on giving them show experience and then selling/leasing them. Jennifer Blades at Willowbrooke Farm in Ann Arbor has Diesonnevanck and Easy. Jassa Williams in New Hampshire has Chin and Balera. Tricia Moss in Boston has Aviator and….. Greg Crolick took in and sold Encore, and Brandt Clark in Michigan took Cirocco and Dileva for some extra training. This has allowed us to have more room in the barn that is still standing and also, most of these horses were in an older age group. Therefore, Claybrook has been able to start working more with the younger stock and hopefully soon, we will be sending more horses to these trainers! We greatly appreciate their help and hope to keep doing business with them. "THANK YOU! We’d like to thank our quick thinking staff for getting the horses out last night before the fire consumed our training facility and equipment barn. Although there were a few employees seen for smoke inhalation, everyone and the horses are alive and well. We want to send a heartfelt THANK YOU to all the fire, rescue and emergency personnel who arrived quickly to keep the fire contained and who orchestrated the scene. We are humbled by the outpouring of support from friends, neighbors, and our community. We appreciate your offers and well wishes. We are very grateful this wasn’t any worse. We are currently exploring options for another location to continue our training until we can rebuild." Claybrook has a few different age groups at the Vanderploegs in training. There are a couple 6 year olds: Ersina, Elinde, a group of 5 year olds: Fairhope, Florensina, Fanfare, Fede, Famorka, And Zoe. She is older and working on getting back into shape before she goes back out to Boston for lease. Last years’ Keuring held at our farm in September was very successful. There were three 4 year old mares that earned their star eligibility and two the also earned keur eligibility. Frodea (Indorado x Corland) and Florensina (Chello III VDL x Emillion) passed their jumping IBOP test, and Jenakina CBF was awarded first premium as a jumper foal. Unfortunately, we are sad to report that Jenakina had an accident in June and had to be put down. We greatly regret her loss as she was a very athletic and also sweet filly. Due to the loss of our indoor arena and training barn, we will not host a Keuring this year. The G girls are up and coming riding horses. They are not yet in full time work, but they have been broken and ridden under saddle as well as competed in the 2014 Keuring doing the jump chute for the studbook grading. Three of these four year olds earned a star rating: Gwen, Gersinaa, and Gerlina. Gwen earned 80 points for jumping, and 75 point for conformation, as well as a keur eligibility. Gersinaa also earned keur eligibility. In total, there are six four year old mares: Gwen, Gersinaa, Gavanta, Gikina, Gerdina, and Gerlina. Although not all of them competed in the keuring, all of them are very nice tempered and easy going mares. We are excited to get them into work and start showing as we believe they will make great competition horses. 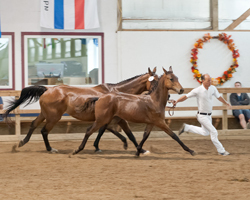 The KWPN-NA Claybrook Farms Keuring will be held on Sunday, September 7, 2014. For the convenience of those attending here is a link to the hotel/motel locations near us. As soon as we have the final entrants list from the KWPN we will email everyone the brochure for the CBF Keuring. Please be sure to use a current email address when you register for the Keuring so you don't miss our brochure. The brochure will include stall reservations, information about our location, and other important information. Any questions don't hesitate to ask. We look forward to seeing you this fall. • 4th place in Top Five of Jumper Foal—Irusa CBF (Atlantic x Indoctro pref) bred & owned by Waino Pihl & Susan Taylor of Claybrook Farms. • Reserve Champion in Top Five of 3-7 year old dressage mares—Feikje Balia P. Ster, Keur/elig (Contango x Bruggraaf) bred & owned by Klaas & Mares Vanderploeg. • 4th Place in Top Five of 3-7 year old jumper mares—Famorka W Ster, keur/elig (Bugatti VDL x Goodtimes) owned by Waino Pihl & Susan Taylor of Claybrook Farms. • 5th place in Top Five of 3-7 year old jumper mare—Frodea Ster, keur/elig (Indorado keur x Corland keur) owned by Waino Pihl & Susan Taylor of Claybrook Farms. • Reserve Champion of Jumper IBOP in Top Five of 3-7 year old jumper mare IBOP—Ersina Ster IBOP keur (Carolus II x Burggraaf) owned by Waino Pihl & Susan Taylor of Claybrook Farms. • Reserve Champion of Claybrook Farms Cup for Three Year Olds— Frodea Ster, keur/elig (Indorado keur x Corland keur) owned by Waino Pihl & Susan Taylor of Claybrook Farms. 5th place of Claybrook Farms Cup for Three Year Olds- Famorka W Ster, keur/elig (Bugatti VDL x Goodtimes) owned by Waino Pihl & Susan Taylor of Claybrook Farms. We congratulate all the breeders and owners that attended. We also want to thank the judges and the CBF friends and staff who helped make this keuring possible. The quality outlook for the Midwest KWPN breeders and owners continues to be very strong. We thank the breeders and owners for making the long trip to Ithaca, Michigan and look forward to seeing them next year. Zurich and Brooke Taylor of Moss Show Stables competed in two shows and placed first or second in seven events ranging from Adult Amateur Hunter (3’-0”) to Amateur Adult Medals. Brooke has done a great job with Zurich. Zolinde, shared by two Moss Show Stable riders (Niyati Mehta and Vail Cort), have entered three shows from mid June to Mid July. The riders have placed 1st or 2nd in 15 classes ranging from High Modified Hunter to Equitation over fences (3’-0”). We wish all the riders good luck in the Fall competitions. Over the two week show, Aviator placed 1st and 2nd in four large classes (12-20 horses) of 7/8 year Young Jumpers. Terri said that Aviator loves to jump and wants to win. Zikina received blue ribbons in her 1.15 meter classes and moved up to 1.25 meters. She is still learning the program, but is showing she can be very successful at the higher level. Aaron (Ambassador) also competed in his first 1.0 meter jumper class (93 entries) and received a blue ribbon. Starting with the first week of July, Kim and Terri will be competing the horses in Traverse City at the Horse Shows By The Bay. We look forward to seeing our horses compete and having Kim and Terri as guests at our farm. Kim Farlinger rode Aviator to 3rd place in Aviator’s 1st mini Grand Prix. The class contained 30 horses ridden by such top riders as Chris Kappler, Peter Leone and Laura Chapot. 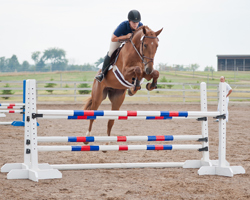 In the second week, Kim rode aviator to 1st place in the 7/8 year old young jumpers. Overall, this was a great show for Aviator. Since Kim Farlinger started riding Zikina, the two have gone for 10 successive clear rounds at shows in Florida and New Jersey. In the Princeton show, Zikina placed third in two large classes 1.0 and 1.1 meters. She did compete in a 1.2 meter class and knocked down a rail with a minor rub, but still placed third. This was her first rail down with Kim!! The KWPN-NA has set the dates for the Keuring locations this fall. Claybrook Farms Keuring will be held on Saturday, September 7, 2013. For the convenience of those attending here is a link to the hotel/motel locations near us. As soon as we have the entrant information from the KWPN (probably the first week in August) we’ll email everyone the brochure for the CBF Keuring. We look forward to seeing you this fall. Good Luck at the shows this summer! Ocala, Florida-- HITS III Premiere—January 30-Feb 3, 2013—Great start for CBF horses and Kim Farlinger. Kim Farlinger and Terri Brent reported very good results for our horses. Kim rode Chicago CBF in his first major show at Level 2 (1.0 meter) and placed 7 in class of 42. Similarly, Kim rode Zikina Field CBF in her first major show in Level 2 class and placed 3 in class of 44. Kim also rode in her first show of 2013. What a great start for 2013!! Zarusa CBF won her class of 43 in Level 4 (1.15 meter). On November 10 and 11, Susan and Lauren Buck attended a two day Frank Madden Clinic in Gurnee IL. Frank focused on the training and conditioning of young jumper horses. On November 30 and December 1 and 2nd, Susan and all CBF trainers attended a clinic near Indianapolis sponsored by Alison Leclerc . She brought to the US one of Germany’s leading young jumper horse trainers, Wolfgang Winter. Wolfgang focused on dressage work and gymnastics to prepare/develop a young horse’s jumping skills. Susan and Alison met a few years ago at a young jumper training seminar in Reno, Nevada. 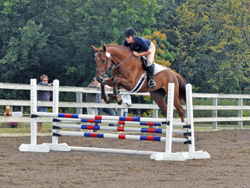 Alison has worked at premier young jumper horse training farms in Mexico and Germany. We are pleased to have the opportunity to work with her. Earlier this year, Alison visited Claybrook Farms and we crafted a relationship that is continuing to expand. She was critical to our tremendous success in the Keuring riding test with our five mares. Four of the five mares became Keur. Alison oversaw the preparation of our mares for their riding test. She also rode two mares in the test. We have sent two of our more experience to Alison for training. We look forward to working with Alison. We are delighted with our success at the Star Sale Select Foal Auction in northern Netherlands. With the help of VDL Stud we selected and purchased four foals (three fillies and a colt). Two of the fillies went to the National Finals show—Hanna VDL (Cardento x Chin Chin) and Horphee KT (Zirocco Blue VDL x Indoctro). The other two foals offered very nice movement and conformation with very good bloodlines: HiLight RJ (Dakar VDL x Quick Star ) and Hamilton (Campbell VDL x Ahorn). Despite 24 horses entered, only eighteen horses were shown due to scratches. Of the 18 shown, eight were rated as first premium, keur eligible or keur. Additionally, six were among the Top Fives in North America. The Midwest breeders continue to produce high quality horses. Foals & yearlings—Three foals were shown and two rated first premiums. The only dressage foal shown rated a first premium: Harlan. (Schroeder x Gribaldi), owned and bred by Maureen Shinksky. 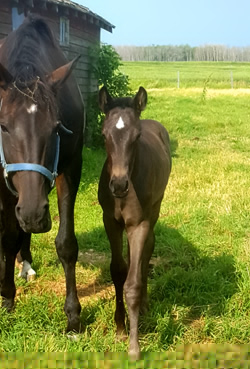 Of the two jumper foals shown, the first premium foal was Heartthrob CBF (Atlantic x Goodtimes) owned and bred by Claybrook Farms. Two dressage yearlings were shown and both rated a second premium. 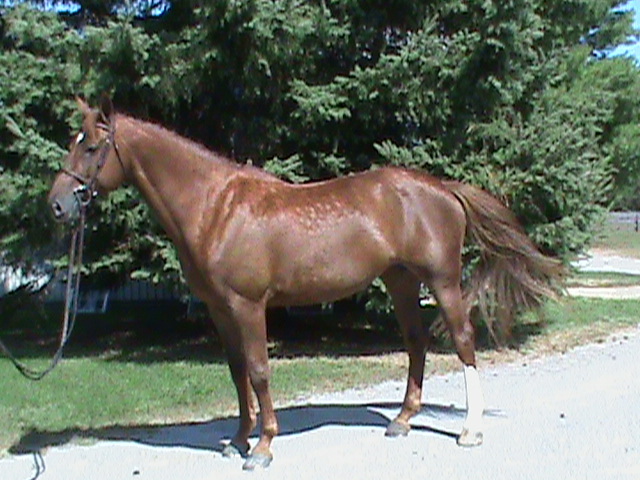 Dressage mares 3-7 year old—Three mares were shown and none achieved Ster status. Jumper Mares 3-7 year old—Four mares were shown and only one achieved Ster status and was ranked 2nd among the Top Five 3-7 year old Jumper Mares in North America. Ersina (Carolus II x Burggraff) owned by Claybrook Farms achieved Ster. She made the Top Five List of 3-7 year old Jumper Mares and is eligible for Keur. Jumper IBOP—Six mares were shown and four Claybrook Farms’ mares qualified for Keur and four ranked in top five across North America. Chiki (Chin Chin x Lupicor) owned by Claybrook Farms was the site champion and ranked number two in North America. She was followed by Classica VDL (Douglas x Quite Easy), Dileva (Wittinger x Kojak), Dara CBF (Corland x Indoctro). These four Claybrook farms mares qualified for Keur. Iron Spring Cup—Five mares were shown in two classes, with five of the horses placing in the Top Fives of their respective classes. In the four-year old Iron Spring Farm Cup class, Dileva placed first, Dara third, and Dylandra fifth. In the five-year old ISF Cup class, Chiki placed first and Classica tied for second. We greatly appreciate all the participants and the fine horses that they brought long distances to the Keuring. We hope that we will see you next year. Our keurings create opportunities to continue learning more about the breed as well as developing a network among other breeders of the fine KWPN horses. Aviator CBF (Silverstone X Ulonja--Ohorn) is having a great show season in the 7/8 Young Jumper Championship (YJC) classes. •	Zarusa was champion 1.25 in Princeton, NJ, placed 2nd and 3rd. Kim Farlinger and Terri Brent of Kim Farlinger Stables near Toronto are now showing and marketing Claybrook Farms jumper horses. They compete at major shows in Traverse City, Lexington, Toronto and Ocala. 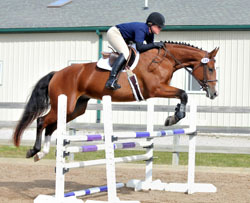 Tricia Moss of the Boston area shows and competes Claybrook Farms hunter and equitation horses in the Northeast US area. She operates her own business—Moss Show Stables. Lauren has worked in Florida and North Carolina prior to coming to Claybrook Farms. She studied young horse training at Meredith Manor. She and Susan collaborate on training the young horses. She brings a wealth of experience with young horses and great energy and patience with our talented young horses. She is a great addition to our staff. Our Keuring date has been set for Saturday, September 22, 2012. For those of you who are attending our Keuring, please click this link to take you to our list of hotels/motels in our area. We will be emailing the brochure as soon as we have the list of entrants from the KWPN (which usually is around the very end of July first part of August). We look forward to seeing you! Twenty horses were shown, with eight horses rated among the Top Fives in North America and twelve horses rated as first premium. This is a great display of high quality breeding from the Midwest. Foals—Four dressage foals were shown and two rated first premiums and one was rated fourth best foal in North America. The dressage foal site champion was: Geluk HVF. (Jazz x Contango), owned by Marian & Bethany Hutchins. The second place foal was Genavia (Rousseau x Jazz) owned by Katie Stanton Nichols. Foals--Four jumper foals were shown and all were rated first premiums and one was rated as Reserve Champion in North America. Gracerusa CBF (Laroche x Indoctro) owned by Claybrook Farms was rated first premium. The second place foal was Genuine CBF (Corland x Chin Chin) also owned by Claybrook Farms. 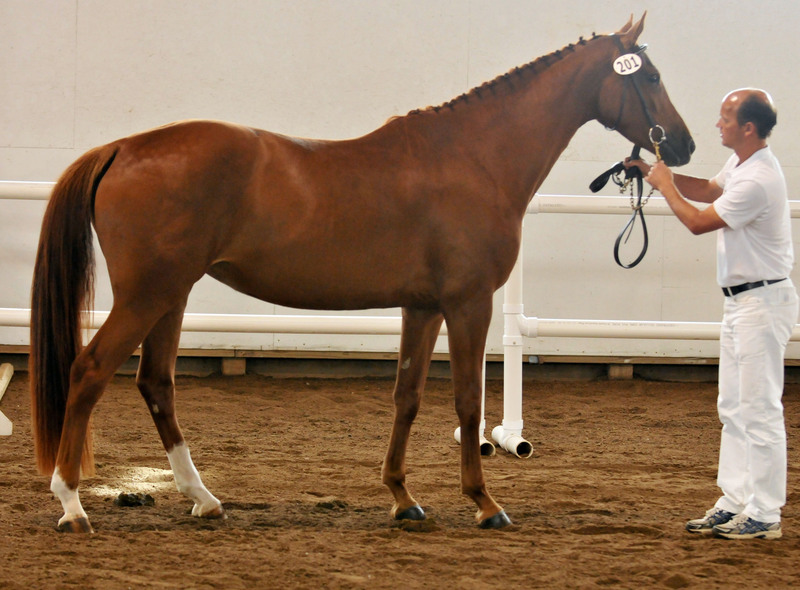 Two year old Fillies and Geldings Dressage—Three fillies and geldings were shown and two rated first premiums with one rated Reserve Champion in North America. The dressage two year old site champion was: Eerste Zarma. (Jazz x Rouseau), owned by KC Dunn. The second place two year olds was E’Clat(Contango x Gribaldi) owned by Sandra Raynor. Dressage Mares—Three mares were shown and one achieved Ster status and ranked as the Top Five 3-7 year old Dressage Mares in North America. Zoe Isabella(Kevekko x Rampal) owned by Sharyl Hilliard was the North American Champion. Jumper Mares—Four mares were shown and three achieved Ster status and two were ranked among the Top Five 3-7 year old Jumper Mares in North America. Dileva (Wittinger x Kojak) and Dara CBF (Corland x Indoctro) both owned by Claybrook Farms achieved Ster. Both mares made the Top Five List of 3-7 year old Jumper Mares with Dileva ranked as Champion in North America and Dara CBF ranked fifth. 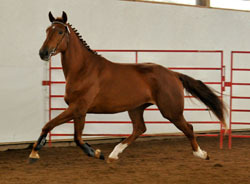 Dressage IBOP—One mare was shown and became the North American champion. Zoe Isabella (Kevekko x Rampal) owned by Sharyl Hilliard was the North American Champion. We thank all of the Midwest breeders who attended and presented horses. This was an awesome Keuring in many dimensions. We look forward to seeing you all next year. We also purchased from a private seller two other very nice fillies: an Arezzo VDL x Burggraaf and a Nabab x Emillion. This year is the fourth year for our buying high quality foals at the Star Sale. We do this to supplement our own bloodlines and provide top-level KWPN horses to the US market. Aviator earned a 2nd and two 4th’s in three classes of 8-13 horses for the 6 year old Young Jumper Championship. Zarusa placed 5th and 7th in two 1.0 meter classes where as many as 75 horses competed. In his first major jumping show at Roanoke Valley in June, Voyager placed in ribbons in 9 of 15 classes (e.g. 2’-9” hunter, equitation, 1.0 meter jumper) when ridden by a young amateur rider. At the same show, Zarusa placed in the ribbons in 4 of 6 classes ranging from 1.0 to 1.15 meters. Based on guidance from Aaron and Mallory we shipped four horses to Boston to be trained, competed and marketed. The horses shipped to Boston were Upstart, Whomanta, Wizardry and Berghoff. The four horses were going to the same trainer, Marybeth McGee of Herring Brook Farm, who placed Upstart with an outstanding young rider. This combination had a very successful 2010 in equitation. 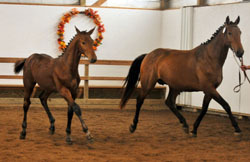 We hope to have more of our horses receiving high honors in equitation classes in 2011. Aaron and Mallory spent two days evaluating our young horses and took five 6-9 year olds back to Ocala to train and compete them. 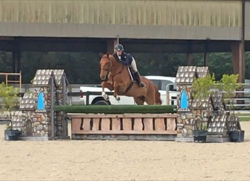 We greatly appreciate the Vale’s interest in our young horses and their ability to train the horses to be successful at major hunter/equitation and jumping venues. They selected three seven year olds: Zarusa, Zikina and Zurich. They also uncovered Voyager, who had been competing in dressage. Aaron wondered where we had been hiding this horse. And they selected one six year old, Avenue Blue. 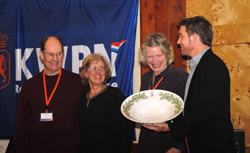 We are greatly honored to receive the Breeder of the Year award from the KWPN-NA. This award is based on a breeder’s consistent Keuring and sport results over multiple years. Each year only one breeder of the more than 1000 members receives the award. The awards selection committee acknowledged that CBF has been successfully competing its 5-9 year old horses in major shows up and down the east coast. 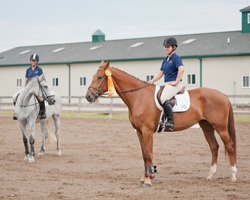 This competition activity enhanced the visibility of the quality of US bred KWPN-NA horses. •	2010-- two of the top five jumper mares, one was reserve champion. •	2009--the top jumper foal and the reserve champion of the Iron Spring Cup for five year olds. •	2008--number one Keur mare and a top five ster mare. Nada Wise of Tomball, TX has taken over training and competing of Wizardry and Berghoff. Wizardry began his competition for 2011 by competing in a wide array of hunter classes, including the hunter derby. Most classes had jumps at least 3-3 and as high as 4-6. He competed in nineteen classes over the two weeks and placed in the top seven in eight classes—some classes had as many as 30 competitors. Nada was particularly pleased with how Wiz performed in the hunter derby. The derby format is closer to traditional jumper courses where Wiz has focused the past three years. Berghoff entered seven classes—five Baby Greens and two Low Hunters. In the Baby Green Classes, Berghoff placed 2nd twice and in the top seven twice. Most of these classes had between 10 and 30 horses competing. Given that this is the first show he has ever entered, Nada was very please at how well Berghoff performed over the low jumps. Despite competing only four horses (Aviator, Arusa, Wolfgang and Whomanta) in Young Jumper Championship classes and a few speed classes, the CBF horses performed well. Aaron Vale guided Aviator to the top 15 of the East Coast Five Year-old Finals. With respect to the Zone 5 YJC standings, Aviator, Arusa and Wolfgang all placed in the top 10 of the final rankings for the zone in their age groups. We expect to have a larger number competing next year and our plan is to continue moving up the ranks of US breeders. We should have twice as many horses competing in the young jumper classes in 2011: 2-3 five year olds, a couple of six year olds and 4-5 seven/eight year olds competing in the YJC classes. We are in the process of hiring a couple of very experienced trainers who can prepare and compete horses in the Midwest while we plan to continue our national jumper relationship with Aaron Vale in Florida. We also plan to expand our hunter/equitation presence. Upstart and Wizardry represented CBF this year. Upstart and his rider went to the Equitation Finals in Syracuse this year. Both Wizardry and Upstart were at the Pennsylvania National Horse show competing in equitation classes. This fall we developed a relationship with Nada Wise of Houston to compete and market horses in the Texas market. She focuses on jumpers, equitation and hunters. We are looking for a high quality barn in the Northeast area (e.g., NY, NJ, MA) to compete and market our equitation horses. If you know of barn that might fit our profile, please contact us. Thirteen horses were shown, primarily from Michigan, with three horses rated among the Top Fives in North America, and five rated first premium. Foals—Two dressage foals were shown and both rated first premiums. No jumper foals were shown. The dressage foal site champion was: Feikje Balia P. (Contango x Flemmingh), owned by Mares and Klaas vander Ploeg. The second place foal was Foppiano (Rousseau x Idocus) owned by Susan Thome. 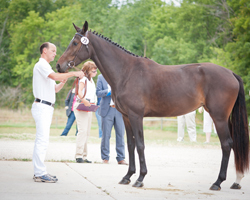 Yearlings—Two dressage yearlings were shown with one rated first premium and Reserve Champion of North America. Elemena (UB 40 x Flemmingh) owned by Cindy Johnson was rated first premium and rated second in the top five yearlings in the North America. 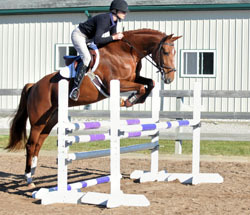 Jumper Mares—Two mares achieved Ster status and ranked among the Top Five 3-7 year old Jumper Mares in North America. Chiki (Chin-Chin x Lupicor) and Classica VDL (Douglas x Quite Easy) both owned by Claybrook Farms achieved Ster. Both mares made the Top Five List of 3-7 year old Jumper Mares with, Chiki was ranked as Reserve Champion in North America and Classica tied for fifth place. We thank all of the Midwest breeders who attended and presented horses. We look forward to seeing you next year. Hopefully, the economy will improve as will the breeding activity. Aaron Vale rode Aviator CBF through three rounds of the East Coast Finals at the Hampton Classic in New York. Aviator was the third highest placing American bred 5 year old. This caps a spectacular first jumping season for Aviator CBF who had not jumped competitively until Aaron Vale took him to the Ocala Hits this Spring. Aaron had a great Young Jumper Finals. His horses placed 1st and 2nd in the 7&8 year old and 2nd in the 6 year olds. A young woman leased and rode Upstart in four shows in Massachusetts and Vermont. In three shows she won each show and qualified for Medals. 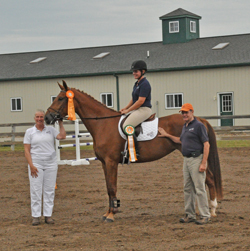 She competed in the Massachusetts Hunter Jumper finals where she won the Medals finals. She scored 87 in round I, a 90 in round II, won the Finals with an 88. She has created a great video and allowed us to use it on our website. It’s great to see our horses so comfortably doing their jobs. Aaron Vale rode Wolf in five classes and placed in three of the five classes. Wolf and Aaron placed first in the Open Speed class of eleven horses of all ages. They placed 2nd in a 1.3 meter jumper and 7th in the $5,000 Rising Start Jumper Classic against 11 entries. Aviator CBF and Aaron placed in three classes, winning and placing 8th in two classes of 1.15 meter, 4th in 5 year old YJC . Mallory Vale rode Wolf to a win in one class of 7&8 year old young jumpers, and Aaron rode Wolf to a 5th place. Aaron Vale rode Wolf in three classes of YJC 7/8 year old and placed 1st twice and 3rd once, including placing 1st in the qualifying class. The classes included as many as 10 horses, and competitors such as Joe Fargis and Tracy Magness. Aviator competed in three classes of YJC 5 year old and placed 3rd twice and 6th once. Upstart also competed at the 1.2 meters level, where he placed first in the class that he entered and placed 1st in the schooling jumpers division. We just wanted to thank our neighbor for taking the latest picture added to our rotating picture header. It was taken at sunset on her walk one night this month. Thank you for sharing it with us! We've also added the full shot in our Around The Barn shots. Upon reviewing the cut off date for this years Keuring sign up, with out penalty (which is July 9th), and the cut off date for late entries (which is July 21st with a 50% penalty) I came across the report from the Jury for 2009's Keuring. I realized we had not posted that last year, so I thought I'd put the link in for it so you can view it. Please note we are not scheduled for the Seminar this year. Maybe we'll be able to host it again next year. Thank you to all who came. Aaron Vale rode Aviator in six classes of YJC 5 year old and placed 1st, 3rd twice, 4th, 6th and 7th with 6-8 horses competing and ridden by some of the best riders in the country—Pablo Barrios, Kent Farrington, David Beisel, Scott Lenkart. Wolf competed in six large classes (16-33 horses) of YJC 7 & 8 year. Wolf placed 2nd once, but outside the ribbons in the other classes. The horses in these classes were ridden by top riders such as: Kent Farrington, Eliza Shuford, Wim Jannsen, Margie Engle, Pablo Barrios, Candice King. Leslie Cradock, owner of Indigo Stables near Charleston, visited Claybrook Farms in April with her mother and a client. 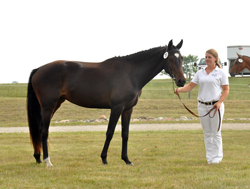 She was in Michigan running a Dressage clinic and helping her client find a horse. She tried a couple of our horses and wanted to take some back to the South Carolina market, despite having found another horse for her client in the Detroit area. We look forward to a continued relationship with Leslie. The 2010 Keuring Tour schedule has just been posted. We are scheduled to host the Keuring on Labor Day, Monday, September 6, 2010. For anyone that is coming this year please make your reservations as soon as possible. Last year there was a local car show and we were unable to block any rooms at the Comfortible Inn for our weekend. We are unable to block rooms this far in advance, so we do not want anyone to miss out on making a reservation this year, since it falls on a Holiday Weekend. If you know you are coming please make your reservation. Once again you will be able to check in the night before the Keuring, if you are trying to figure out your hotel arrangements. Here is a list of some hotels and motels we have used in the past and some that are in the area that we know of. Your comfort levels may vary so please feel free to research the area for any other hotels. Living in a rural community we are limited on the selection and closeness of hotels. Rest assured this notice does not replace our brochure. All stall reservations and details will be emailed approximately the first week of August, after we have received the entrant list from the KWPN office. The brochure will be sent through the US Post Office to those who do not have a good email address when signing up for the Keuring through the KWPN. It was a hectic day for Dey Goodman and Darcy Workman as all four horses competed in two classes as a warm-up for the 2010 season. For the five year old horses (Aaron and Avon), this was their first time away from home. For all the horses this was a good show. For the young horses this was a demanding day. For Dey and Darcy it was a long day—Dey rode 8 horses and Darcy groomed 8 horses. Voyager competed in the Third Level Test 3 and the Fourth Level Test 1. He scored at 61.6 and 59.3, with consistent 7’s on gaits, but 5’s on impulsion and submission. Zazu competed in two Second Level tests—Test 1 & 2. He scored 64.7 and 60, and received a 7 & 8 on gaits and 6’s on impulsion and submission. In his very first show and first time away from home, Aaron (Ambassador) competed in Training Level Test 3 and First Level Test 1. He received a 70.4 and 73.0 respectively. He received 9’s on gaits, 6’s & 7’s on impulsion and submission. Similar to Aaron, this was Avon’s first time away from the farm. He scored a 69.1 in Training Level Test 1 72.9 in Training Level Test 2. The judge rated his: gaits at 8 and 9, impulsion at 7, and submission at 5. Aaron Vale and Colin Quinlan rode Wolfgang CBF in seven classes ranging from Low Junior Jumper to Young Jumper 7 & 8 year old. Wolf consistently placed in the ribbons except for one class, where he placed eleventh in a class of 41. In the higher classes, levels 7 and YJC 7&8 wolf placed 2nd and 4th. Whomanta B competed in eight classes, with seven of the classes being YJC 7&8. Aaron Vale consistently placed her in the ribbons in all of the classes. Wizardy CBF was ridden by younger riders, Camilla Cook and Emily Van der Walde, in five classes ranging from: Level 2, Medals and Equitation 16-17. He placed no lower than 5th in classes as large as 42. Britiani Brown, who rides for Aaron Vale, rode Whomanta B to third place in Seven & Eight Year old Young Jumpers. She competed against 14 horses in her very first level seven event. Earlier in the week, Britiani rode Whomanta B to 6th place in Level 5 (28 competitors). Aaron Vale rode Whomanta to 6th place in Level 3 (118 competitors). Whomanta is a careful jumper and seems to do better when challenged with higher jumps. Britiani also rode Wizardry CBF in two events Level 2 (55 competitors) and Level 3 (69 competitors). He placed 8th and 7th in two very large classes. Arusa CBF competed in her first show with Britiani aboard and placed 8th in a class of 25 horses. Aaron Vale rode Wolfgang to Champion of Level 5 Jumpers and placed third in Level 6 Jumpers. Aaron plans to move Wolf up to Level 7 in his next show. In Level 4, Aaron rode Whomanta to 8th place in a large class of 44 horses. Aaron was very pleased with the rapid progress of the horses. Aviator and Arusa are awaiting their debut in the Ocala competitions. Ulonja and her Foal are doing well. 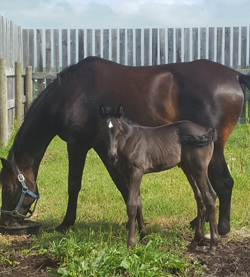 Her filly received an 8.5 for movement, and an 8 for confirmation at the Canadian Warmbloods Foal class. Congrats Jaida! Great Job "Lord Stanley" (Easy Heights CBF)! Venice, FL Show: Champion for 3' equitation; 4th in the Hunter Derby; 2nd for 3' Hunters; and CHAMPION in non-thoroughbred at 3'.Congrats to the Best Family! "Lord Stanley" (Easy Heights CBF). Photo Credit: Tetongirl Photography - St. Johns, MI. Thank You Bart & Lana! Congratulations to Danielle Sweeting for purchasing Arusa (above) through KFS! Chiki 2012 Keur. Thank you to Renee Weedon for photographing the Keuring for us! Deliva 2012 Keur. Thank you to Renee Weedon for photographing the Keuring for us! Ersina 2012 Keur. Thank you to Renee Weedon for photographing the Keuring for us! Classica 2012 Keur. Thank you to Renee Weedon for photographing the Keuring for us! Dara CBF 2012 Keuring. Thank you to Renee Weedon for photographing the Keuring for us! Heartthrob CBF 2012 Keuring. Thank you to Renee Weedon for photographing the Keuring for us! Thank you to Janko, and the Jury, Bart Henstra & Lana Sneddon for taking time out or your busy schedules to work the Keurings again this year! Thank you to Renee Weedon for photographing the Keuring for us! Above Footage is of Upstart ridden by Lexie in the Zone 1 Maclay Regionals. CONGRATS to them for moving forward to the Maclay Finals in Syracuse!